The Terrifics start to get back together in the latest issue, by Lemire and Bennett. It’s not like I was surprised that each of the team decided, on their own, that they were happier as part of a group. One must admit that is about as formulaic as it gets. But there is so much exuberance in this book, such playfulness with the characters, that I don’t mind going through the formula, if the ride is this much fun. This issue manages to squeeze in some dimension-hopping cameos, and brings back Offspring, one of the best characters to come out of Kingdom Come, who has never quite found a footing in the mainstream universe. 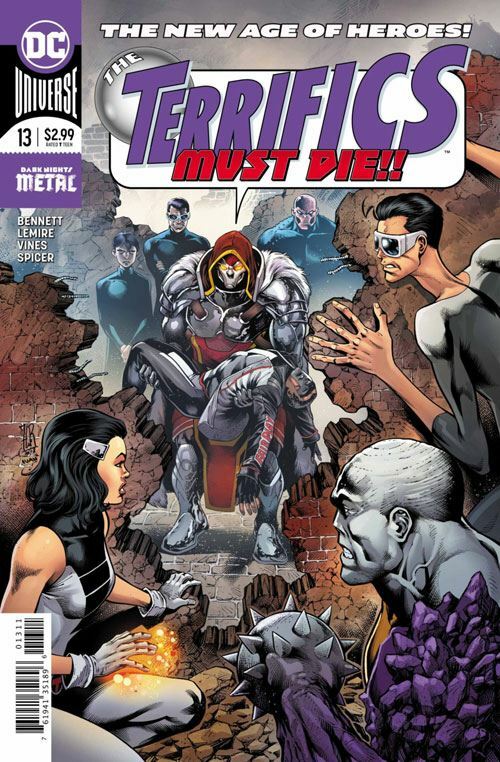 The core of the issue revolves around Mr Terrific himself, who has encountered an alternate reality version of his dead wife, Paula. In this Paula’s universe, Holt was the one who died, and Paula the one who wound up becoming a Terrific. While I really wanted to see them dive into each other’s arms, the pair are both professionals, more devoted to dealing with the danger they are currently in. But that’s fine. It’s a not-formulaic way of building the suspense in the romance we want to see. The villains are the only ones to get short shrift in this chapter of the story. But that’s ok, the conclusion of this issue basically ensures that they will have more important roles next time around. Another easy breezy issue of this lemon squeezy series.